Written by Matty Cohen on October 11, 2013 Blog, Woo news. 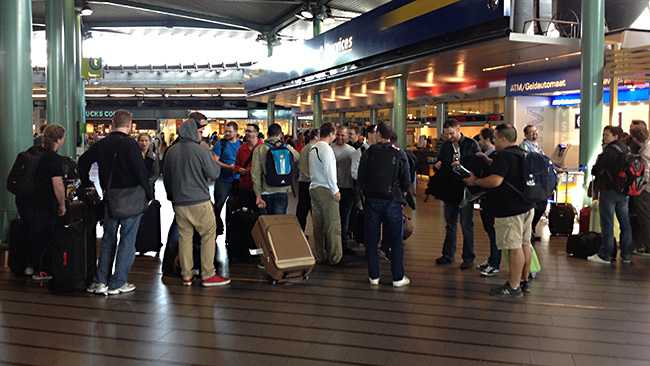 Early this October, the entire WooTeam arrived in Leiden for WooTrip 2013. For those unfamiliar with WooTrip, this event is the annual opportunity for our entire team to converge on a single location for a week of team building, bonding and a chance to work side by side with team members who all usually work from remote locations across the globe. This year, we all also attended WordCamp Europe, as a part of our WooTrip. With our entire team in one place, this was also an opportunity for us to soak up the unique culture in Leiden. In addition to this fun, our entire team were active in our help desk, to ensure an uninterrupted support experience. Handshakes as some of the team meet for the first time at Schipol airport.After flights and trains disembarked around the world, our team were full steam ahead towards Leiden, a quiet town in Holland. After many hours of travel, we arrived at Amsterdam’s Schiphol airport and the real adventure began- finding our colleagues. Once we all found each other (bear in mind, some of us had never met in person until that time, making finding each other somewhat more difficult), we embarked on our train ride through to Leiden. The day was then spent checking into our hotel, re-connecting with our long-distance colleagues, resting up from the long journey and checking in at our help desk. We then decided to part-take in the 3 Oktober festival in Leiden. The Siege of Leiden festival is a celebration of the end of the Spanish siege of the town of Leiden in the 1500’s. The festival is a town-wide street fair including live music, carnival rides and, of course, chips with mayonnaise (“friet met mayo”). To continue the celebrations, we met for a full-team welcome dinner, as well as celebrating our business development manager, Joel’s, 30th birthday, with an amazing cake, layered with “Dutch Orange” icing. What a perfect day to arrive in Leiden. Once we’d all settled in and had our fill or chips with mayonnaise, the WordPress-centric part of our trip kicked into full force. Beginning with a team workshop and dinner centred around our WooCommerce Subscriptions extension, we were ready to go and hungry to discuss all things WordPress. Brent Shepherd, the developer of the WooCommerce Subscriptions extension, gave a passionate and informative lecture about the plugin, it’s roadmap and some wonderful examples of where the system is being used in the “real world”. This affirmed our passion for online commerce and was a great way to hear more from Brent about his vision for the system. For the next two mornings, we rose early to head out to WordCamp Europe, connect with other attendees and hear some inspirational lectures. 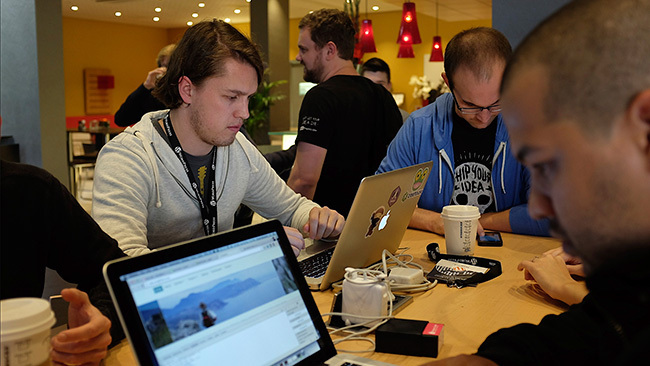 Being the first ever WordCamp Europe, this was also a momentous occasion we are proud to have been a part of. Many connections were built or strengthened, much knowledge was shared and, of course, much fun was had. Many thanks to all involved in organising the event, and here’s to many more. The next few days after WordCamp Europe were spent soaking up as much of the rich Dutch culture as possible. This involved a few trips into Amsterdam, visiting the Heineken Brewery and, of course, enjoying some more chips and mayonnaise. In addition to the fun, networking and cultural explorations, WooTrips are a chance for our team to connect on a more face-to-face level. This includes several (many) team meetings, debugging issues side by side and, as with each WooTrip, our “State of the Woo” general team meeting, where we discuss how the current year has gone, forecast how the new year should look for Woo and discuss ideas, feedback and areas we’d like to move into, as a team. These meetings are unlike any other we have and are of unmeasurable value to WooThemes and our team. We all left Leiden with happy hearts, inspirational thoughts and a fervour to spur on some exciting new projects we’ve got on the cards. The hotel lobby became the official WooHQ where support tickets were culled. 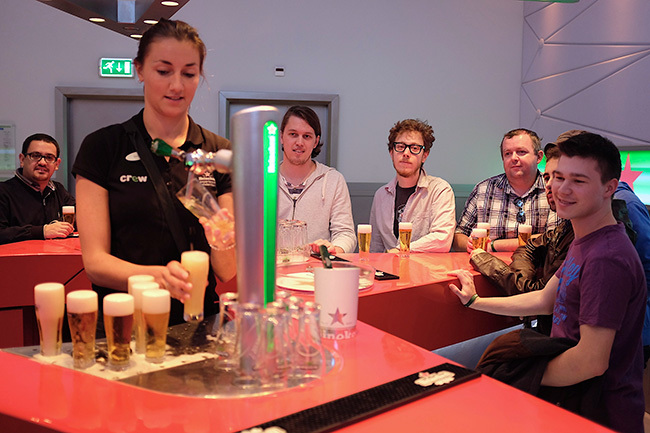 Beer tasting at the Heineken brewery. The WooTeam united, if only for one week…Thanks to everyone involved in making this year’s WooTrip a resounding success, to all the awesome WordPress folks we connected with and to Leiden for having us and accommodating our 30-odd strong team at your restaurants (even if we didn’t make a booking). Looks like a great trip and a valuable time for Woo! More than one beer was had, woops! I believe it’s so important for such a virtual company as WOO to meet in person on a regular basis. I’m impressed (and encouraged) that spending your hard-earn dosh on such events is an important investment in WOO’s future. Bonus: if you guys going away means getting Canvas big updates, you guys should go away more often! WOO Canvas Changelog. SO glad to hear it, Magnus! In kinda-related news, a project mgmt. system I use just went away. I try to assure my clients that WOO will be around for a while and we can feel relatively sure that we’ll be taken care of from some years to come. I was so annoyed that my tool went away, I wrote it up (mentioning WOO as well): How Long Will Your Favorite Product Be Around? It was so good to meet the Woo team in real life after all this time. 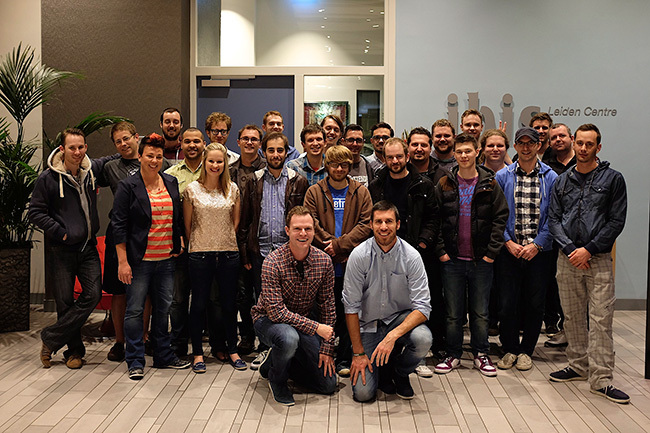 I can tell you they all work incredibly hard on support and talking to the Woo ninjas over the weekend I have a whole new level of respect for how committed these guys are at making great products and delivering awesome support. Likewise Troy, was great meeting and hanging out! I recommend everybody check out WP Elevation to see how they can help your business! Better yet, let’s all meet up with Troy in the land down under! It was good meeting you Troy! all the best with WP Elevation! 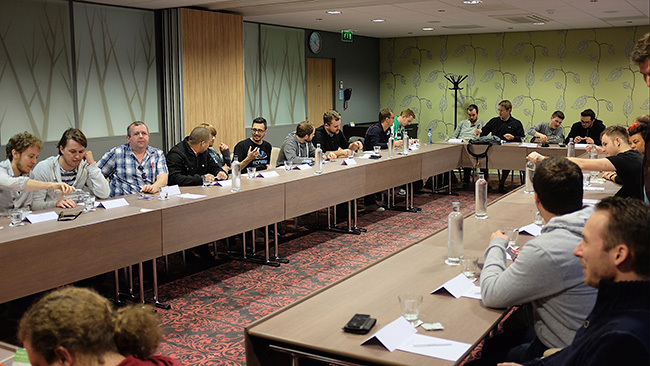 Was nice to meet a couple of you guys and also good to see you giving back to the WP community by supporting WordCamp EU – great idea to make that your WooTrip for this year and your support helped make the event the success it was.